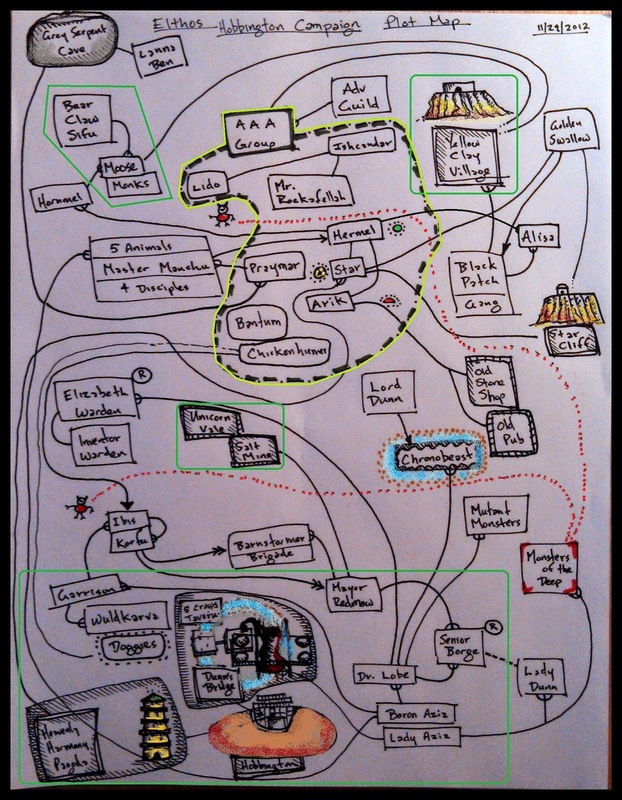 This is the plot map that I created towards the end of the 2012 Hobbington Campaign. It shows all the main Characters and Adventure / Villain Groups, and the primary locations in the Campaign. The arrows show the movement of the Groups, and colored boxes show the related groups. As you can see, towards the end of the Campaign, after about 24 games or so, things had gotten a bit complex. This map helped me a great deal to keep track of the story in terms of plot lines and tidy up the loose threads by the end of the 38th game session, which concluded the campaign with our heroes victorious. It was a great campaign, and this map helped a lot to make it turn out that way.